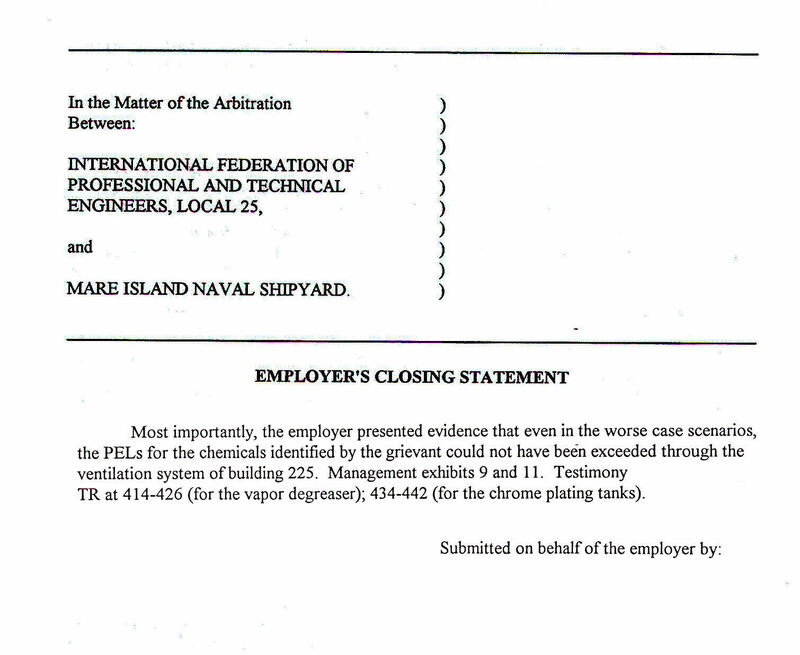 The content of this page demonstrates the deliberate perjury committed by U.S. Navy Management, Navy Occupational Safety and Health personnel and Navy Lawyers in their successful attempt to obtain a dishonest judgment in their favor regarding the Grievance filed against the U.S. Navy for poisoning employees for many years with Hexavalent Chromium and other toxic substances discharged from the Mare Island plating shop. The contents of this page are very technical and detailed because perjury is an extremely serious crime and this seriousness is magnified because this perjury was intended to cover up mass murder committed over decades. The perjury completely destroyed all of the honor of the U.S. Navy leaving it morally bankrupt. You may not have the time, patience of the specific technical education necessary to allow you to navigate through all of the necessary arguments and the mathematics and so for your convenience the perjury is explained in words in the following paragraph. Depending upon how it is designed and operated a chromic acid scrubber will remove the chromic acid in the air passing through it with varying efficiency. A 1980's era scrubber that is well designed and operated properly will remove about a maximum of 97% of the chromic acid that is in the air that is passed through it. Such a scrubber is described to be 97% efficient. The two Mare Island plating shop chromic acid scrubbers were demonstrated to be merely 7% and 17% efficient during testing performed in 1987. A scrubber that is 97% efficient will discharge 3% of the chromic acid that is in the air entering the scrubber. A scrubber that is 7% efficient will discharge about 93% of the chromic acid that is in the air entering the scrubber. The normal operating condition of the two scrubbers is that they were 7% and 17% efficient and so they discharged most of the chromic acid passing through them and largely did nothing. This is the condition they were operated in for decades. In the perjury document the U.S. Navy created a clever complex dishonest written argument in the form of Management Exhibit No. 11 to dishonestly testify under Oath to the Arbitrator that the amount of chromic acid discharged from these same two scrubbers was much smaller than what actually happened. The way they did this was to use complex dishonest mathematics to construct a false argument to make it appear that the amount of chromic acid discharged from the same scrubbers, after they had been rebuilt in 1988, and were being properly operated, and had been restored to about 97% efficiency, was from them before they had been rebuilt, were not being operated properly and were only 7% and 17% efficient. This made scrubbers that were actually 7% and 17% efficient dishonestly appear to be about 97% efficient. This is the big lie that won them the Grievance and deprived you and your dependents of all your rights to medical care and injury compensation that are your right under federal law.. It has taken scrubber test documents found in 2008, a fair amount of mathematics and analysis to unravel the perjury and demonstrate it to the necessary degree of detail. The perjury was put together by very highly trained, intelligent, educated and competent experts who intended it should never be discovered. It was deliberately made to be excessively complex and misleading and so it is not obvious or easy to unravel. But it is what it is. It is a lie and once it is exposed to be a lie it is obvious it is a lie that was testimony while under Oath. While this perjury goes unresolved the U.S. Navy has absolutely no honor and is merely a criminal fugitive from justice living on and enjoying the fruits of robbery and mass murder by stealth. This document, which is an act of Perjury in Writing, was submitted as Testimony while under Oath to the Arbitrator as Management Exhibit No. 11 during the Grievance Arbitration hearing held in August 1996 at Mare Island Naval Shipyard. It purports to demonstrate through misleading and completely dishonest incomplete calculations that chromic acid discharges from the two chromic acid scrubbers on the Mare Island Naval Shipyard metal plating shop were below hazardous levels. However, upon analysis, and once unraveled this twisted document is demonstrated to be nothing more than a tissue of lies of every kind. It is an act of deceit intended to deceive and was cleverly and deviously constructed by U.S. Navy Management Officials to lie to, mislead and trick the Arbitrator into rendering an Award in their favor that is completely wrong and unjust. Note that U.S. Navy management refers to the Permissible Exposure Limit (PEL) in its closing argument. The fact is the "worst case" calculations do show exposures well above the PEL when they are performed honestly in the following. Management Exhibit No. 11, even when it has been corrected so that its calculations are honestly done using the proper data, does not show the enormous extent and amount of the harmful discharge of chromic acid from the two chrome plating scrubbers. The purpose of this page is to only to demonstrate perjury. It is not to provide the correct amount of chromic acid actually discharged from the chromic acid scrubbers. This is provided on the Scrubber Discharge page. The sole purpose of this U.S. Navy Perjury web page is to demonstrate conclusively that the U.S.Navy did not even hesitate one second to consider and then commit willful and deliberate perjury in writing in its attempts to cover up the poisoning, murders, crippling and injuries. I am sure the question will be asked, "Why was this perjury discovered so late"? There are a number of reasons for this. The first is I didn't have the April 5 and April 6, 1988 test documents necessary to detect the perjury until 2008 when they were discovered on the Internet. Management didn't give them to me in 1995/6 as federal law mandated they should. I never imagined anyone could just be so shameless, wicked and evil as to perpetrate an act of perjury in writing about a matter so uniquely important and that the U.S. Navy would be willing to completely destroy all of its honor to cover up this massive crime. Then also, I continue to suffer from the effects of the poisoning of February 17, 1988 and don't often have the strength to make the kind of effort it takes to prepare the new Cheating page. It was during the preparation of the Cheating page of this web site that I discovered the perjury. When I had completed the first draft of the Cheating page I thought over and considered all of the documents I had to make sure that any document that could contribute to the Cheating page had been consulted. It was then I remembered Management Exhibit 11 did have some calculations on it and I looked through all my papers to see if I still had it and to see if it had anything that could be useful. Luckily, it was in a folder. Then I began to look at the calculations for the first time and saw that Perjury had been done. I discovered my copy of Management Exhibit No. 11 on Thursday March 11, 2011 and this is the day the perjury was discovered. Section 1, “WORST CASE TESTS”. The deliberate misstatement in this title is the use of the word “TESTS”. The results shown under this title are the result of dishonest calculations performed using data extracted and/or "cherry picked" from a number of tests performed on the chrome scrubbers. They are not test results they are estimate calculation results. This title is also a deliberate attempt to mislead because it is not an accurate description of the situation concerning the operation of the plating shop chrome scrubbers. The use of the term “WORST CASE” strongly implies an unusual or abnormal condition that is intermittent and subject to being brought under control. The actual fact is the situation that existed from the time the scrubbers were installed in 1951 is that they were highly inefficient because they were not maintained, their performance as not monitored, they were run without the necessary flow of cleaning water and were basically completely neglected and left to deteriorate. The accurate title for this Section is “NORMAL OPERATING CONDITION CHROME DISCHARGE DISHONEST AND MISLEADING ESTIMATE CALCULATION RESULTS”. 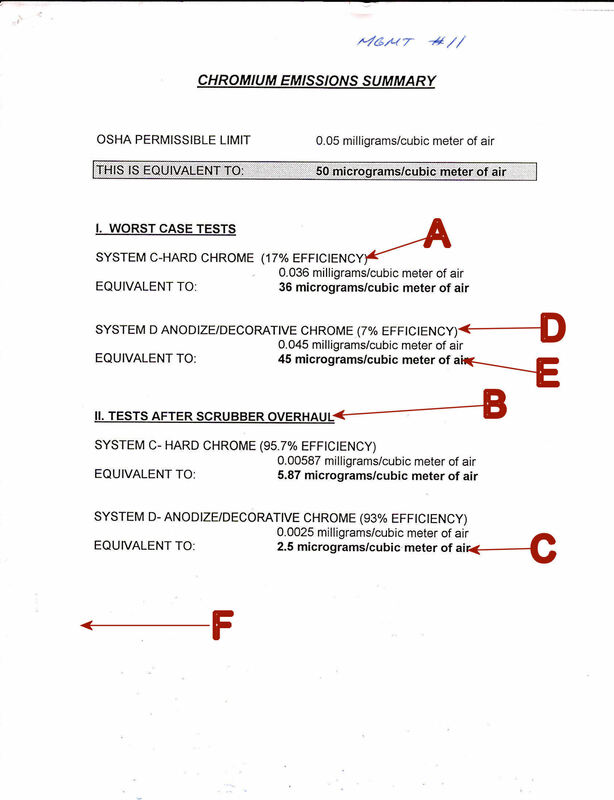 Also, it is important to understand that a calculation of chromic acid concentration in the scrubber outlet air only has factual meaning when it is calculated using both the lb/hr chrome discharge rate and the air flow measured during the test that obtained the lb/hr chrome discharge rate. Using a different air flow, as has been done, is basically to perform a "what if" calculation, i.e. what if the air flow is increased what will the resulting chromic acid concentration be. It is completely dishonest to call a calculation that is actually a "what if" a "worst case". This page is made up of "what if" calculations. It is also dishonest to label these fantastic imaginative calculation results to be "test results". They are not test results they are calculation results that are the product of "what if" speculations using cherry picked data selected to obtain the results management desired to obtain..
A: This title indicates the results are for a hard chrome plating scrubber prior to being rebuilt and having 17% efficiency. This is contradicted by two data sources. The first is Page 1 of 2 of the three pages included in Management Exhibit No. 11.. It states in Para. IB that the chromic acid emission data was taken from the April 5, 1988 BAAQMD test of the hard chrome plating scrubber. This test was performed after the hard chrome plating scrubber was rebuilt. It was rebuilt by the Mare Island Naval Shipyard Work Permit of 3-15-88. This was a "Job In Progress" work permit meaning that the work was actually in progress as the work was being performed. This work had to be completed prior to April 5, 1988 otherwise that test could not have taken place. The Management Team at the Arbitration hearing had to know these facts at the time Management Exhibit No. 11 was submitted to the Arbitrator. This statement alone makes the entire document to be a deliberate act of perjury; but there is more. B. This statement has the effect of furthering the fiction that the data in the two following calculation pages has been scrupulously segregated so that the "worst case" calculations uses data from scrubber tests on scrubbers that have not been rebuilt, and the "best case" data is from tests performed on scrubbers after they have been rebuilt. This is not correct and has to be understood to be a deliberate falsehood. C. This is an honestly calculated "best case" but the scrubber test (RSA of August 17, 1988) the data is taken from is the worst kind of study, is full of cheating, is totally corrupt (See Cheating) and its data is far below that what would be obtained from plating shop normal operating conditions. D. Once again the lie is promoted that the data used to calculate this result came from a scrubber prior to it being rebuilt. The chrome emission data for this result came from the April 6, 1988 BAAQMD test that was performed after the scrubbers were fully rebuilt by the Mare Island Naval Shipyard Work Permit of 3-15-88. By promoting this fiction the person who prepared this wretched work of art was able to avoid the last step in the calculation which is to adjust for the "worst case" scrubber efficiency. This is done in the corrections below and the result is much higher chromic acid emissions. E. This number is not supported by calculations. Only the data that should have been used in calculations is provided. There is a good reason that can explain this deliberate omission. The Federal OSHA Permissible Exposure Limit published in the Mare Island Shipyard OSH Manual for personnel exposure to chromic acid in 1988 was 0.1 mg/m3 of air. Associated with a PEL is an Action Level (AL). The AL is half the PEL or 0.05 mg/m3. The Shipyard Occupational Safety Manual in paragraph 3.2 stipulated actions to be taken in the event the level of a chemical exceeds or "Has the Potential to Exceed" the AL. The shipyard knew the scrubbers were discharging chromic acid well above the 0.05 mg/m3 level. They never acted as the OSH Manual directed because they wanted to hide what they were doing to all their innocent victims. F. This is the missing section. The scrubbers, when they were run with water, discharged a chromic acid contaminated mist. Because the tests of 5, and 6 April, 1988, those of 10, and 17, August 1988 and doubtless those conducted in 1987 were conducted with clean fresh water circulating through the scrubbers the contribution of chromic acid emitted from the scrubbers by this mist was zero. But any worst case analysis must include the concentration of chromic acid from this mist because available data demonstrates the concentration of the chromic acid in the scrubber water could be very high; no less than 50 and even greater than 500 PPM. A discussion of this contaminated mist is provided in Section 5 below. Note: In the following corrected calculations an additional step (F) has been added to correct the results obtained from an optimized (95.7% and 93% efficient) scrubbers to indicate what would result from normal condition (17% and 7% efficient) scrubbers. This is a small copy of the "Worst Case Analysis" that concludes under the worst case the hard chrome scrubber would emit only 36 micrograms of chromic acid per cubic meter of air. The criminal nature of these phony "worst case" calculations is that the data came from scrubber tests performed AFTER they had been rebuilt (95.7% and 93% efficient) and were highly efficient at removing chromic acid.. But the normal operating condition of the scrubbers was that they were highly inefficient at removing chromic acid from the air (17% and 7%). Because of this the calculations must have a final step "F" to adjust the scrubber discharge concentration of chromic acid to account for this huge difference in efficiency. It is obvious that to miss attribute the data on the Front Page of Management Exhibit No. 11 ; to attribute it to be the result of a test that was performed before the scrubbers were rebuilt, rather than after they were rebuilt, is an act of deliberate perjury. In the following corrected calculations the missing scrubber efficiencies adjustment has been made and the final results are vastly different. There are three major instances of data misuse and a complete lie on this page. In the following the lettered paragraph refers to the red letter shown on the page. A. The calculation of Part I purports to show the amount of chromic acid discharged from the hard chrome plating scrubber when it is only 17% efficient. This is a "BIG LIE". The amount of chromic acid shown to have been emitted on this page in Part I is the result of the April 5, 1988 BAAQMD Test and this is correct worse case data. However, the 17% efficiency applies only to this scrubber when it was tested in 1987. Prior to the April 5, 1988 test it was rebuilt completely. This is demonstrated by Mare Island Work Permit of 3-15-88 directing the hard chrome scrubber be rebuilt as a "job in progress" at that time. This work permit means that the hard chrome plating scrubber was fully rebuilt and optimized and was at least as efficient at capturing chromic acid during the April 5, 1988 BAAQMD Test as it was during the August 10, 1988 test, which on the average, per the RSA August Test Report on page 9, was 95.7%. It is important to understand that in 1996 U.S. Navy Management refused to turn over to me copies of the 1987, and the April 5, and April 6, 1988 plating shop scrubber tests. This provided them with a shield behind which to hide their criminal misuse of data on from these tests in Management Exhibit No. 11. B. This airflow through the scrubber data is a pure fraud. The worst case is the lowest amount of airflow. Since the amount of chromic acid discharged is taken from the April 5, 1988 report it is only appropriate to take the air flow data from the same report. This is shown to be an average of 17,000 cubic feet per minute of airflow and not the 19,440 that was dishonesty used. Please see "Notes On Scrubber Air Flow Rate"s at the bottom of this page for an explanation of the importance of air flow rate numbers. D. Calculate Chromic Acid discharge quantity: .00263 lb/hr X 454 grams/lb X 1000 mg/1 gram = 1194 mg/hr discharged Chromic Acid. The way an “lb/hr” chrome discharge rate is calculated in an actual test report is that the concentration of chrome in the air actually discharged from the scrubber during the performance of the test is collected by analytical instruments, analyzed by a laboratory, and reported in units of Hexavalent chrome weight per unit of air. During the test the actual air flow through the scrubber is measured, using precision instruments, in units of cubic feet per minute. Then the two are multiplied together, using the minute to hour conversion factor, to obtain a rate of chrome discharged per hour. So the “lb/hr” is not directly measured. It is a derivative result that is the product of calculations performed as part of the making of the test report. It is completely dishonest to take a much larger air flow from somewhere else and then use it to make an estimate using a “lb/hr” from another test because the flow rate from the “lb/hr” reporting test is “baked into” the lb/hr reported result. To take the flow rate from one test and then use it with the lb/hr reported from another test is an act of complete invalid mathematical fantasy having no actual integrity or meaning except as a "what if" calculation. It is a pure form of engineering malpractice exhibited under oath by a person who knows enough to know exactly what he was doing. The fact is the 11/12/1987 BAAQMD test is a true “Worst – Normal Situation – Case”. The reported 0.00313 lb/hr is extremely high. We know that there was a specific air flow rate measured during the 11/12/1987 BAAQMD supervised test. 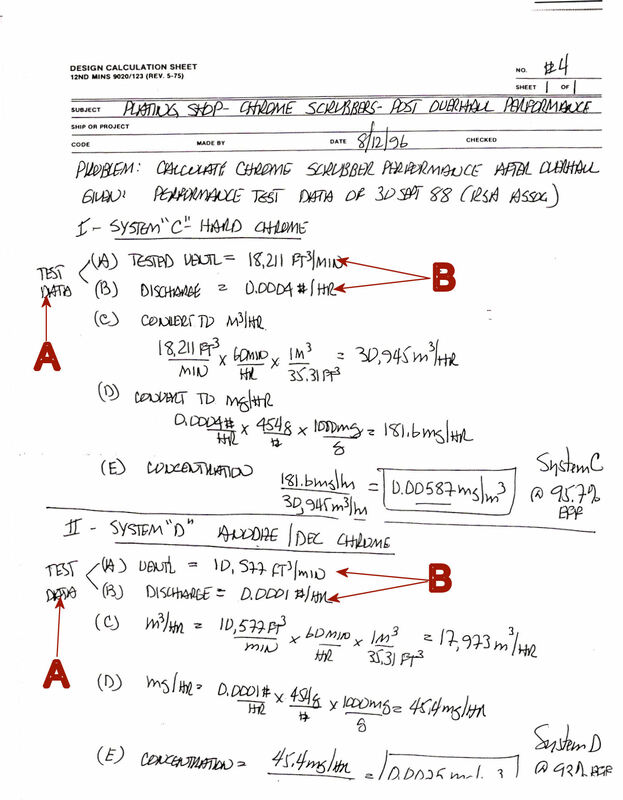 There can be no doubt the author of this document decided to not use the flow rate measured during this test because the result of honestly performed calculations would have been the result that Mare Island regularly and routinely discharged hazardous quantities of Hexavalent chromium into the breathing air of adjacent buildings. D. This air flow data is again not the worst case. The worst case chromic acid concentration results when the air flow through the scrubber is the least. The least flow through the decorative chrome/aluminum anodizing scrubber is shown in the August 17, 1988 RSA test to be 10,577 CFM. It was completely dishonest to use this extremely high air flow figure and was a deliberate act of engineering malpractice to use it in these calculations when they are labeled to be "worst case". Notice also that the air flows used for the "worst case" and "best case" for the same scrubber are different. In the "worst case" it is 18,485 CFM and in the "best case" it is 10,577 CFM. What's going on here? The same scrubber with the same fan that has only one speed and yet there are two different air flow numbers? The answer is this is just dishonest number cherry picking used to produce the necessary result to present to the arbitrator. It's just a pure form of dishonesty. D. Calculate Chromic Acid discharge quantity = 0.00313 lb/hr X 454 grams/lb X 1000 mg/1 gram = 1421 mg/hr chromic acid discharge. = 0.567 mg/m3 / 0.10 mg/m3 = 5.6 times the 1988 PEL. This demonstrates why the step F calculations were not performed in Management Exhibit No. 11 and perjury was committed to hide the fact the data was actually from a rebuilt scrubber. D. Calculate Chromic Acid discharge quantity: .00313 lb/hr X 454 grams/lb X 1000 mg/1 gram = 1421 mg/hr discharge. = 0.983 mg/m3 / 0.1 mg/m3 = 9.8 times the 1988 PEL. This demonstrates that under the worst case conditions, even using data from a test that is full of cheating to lower the amount of chromic acid discharged, the "worst case" amount of chromic acid emitted from the decorative chrome/aluminum anodizing scrubber exceeded the maximum personnel exposure limit of 0.05 mg/m3. This is why incomplete and dishonest calculations were used to fabricate this completely phony document. It can plainly be seen that page 2 of 2 does not contain any calculations from part II of page I. This demonstrates that there was never any intent to disclose these calculations by the U.S. Navy..
A and B. There wasn't any need to lie or cheat on this page or engage in any of the many other fancy data card tricks used in the "worst case" analysis. Getting low results was easy because it was built in. The reason for this is that the RSA Tests of August 10 and 17 are actually confirmation tests. Their purpose was to confirm that a set of recommended operating parameters for the chrome plating section of the metal plating shop would produce results that were low enough to allow the BAAQMD to issue chrome plating tank operating permits. The problem is that in actual practice these operating parameters were so limited it was a practical impossibility for the plating shop to operate under such severe restrictions. The Bay Area Air Quality Management District (BAAQMD, the State of California) engaged in a program of random plating shop tests as part of its process of formulating new regulations for airborne chrome emissions. Mare Island got picked for one of these and so had to undergo a surprise BAAQMD supervised set of tests in 1987. There was some cheating on this test, and the chrome plating scrubber efficiencies were so low that Mare Island got rewarded for this with a letter on 1-20-88 that put the entire plating shop in jeopardy and which demanded all the plating shop scrubbers be tested. The result of this was the April 5 and April 6, 1988 BAAQMD supervised scrubber tests. Immediately prior to these tests the two plating shop scrubbers were rebuilt by Mare Island Work Permit of 3-15-88. There was no cheating on the April 5, 1988 test of the hard chrome plating system. But there was cheating on the April 6, 1988 test of the decorative chrome/aluminum anodizing scrubber. The problem is the results were not good enough to allow the plating shop chrome plating shop permits to be renewed. Accordingly, the U.S. Navy hired outside contractors to perform another series of tests, both of which are full of cheating. This is why the U.S. Navy had no problem performing a fine set of honest calculations using the data from this test to show the "best case" analysis. It is the best case, but it's also a fantasy because, it is for scrubbers that are 95.7% and 93% efficient being fed chromium from plating baths that are being operated at electrical loads that are ridiculously below normal operating levels. The fact of the matter is that for all of their useful working lives the scrubbers were dirty, unmonitored, not provided with water, and were 17% and 7% efficient. at best. And this is the real point of the matter. Then also there is all the CHEATING that took place during the tests. This cheating has to be accounted for, along with the scrubber efficiency differences, to get a real idea of how much super toxic chromic acid was spewed onto the shipyard for all those decades. If you would like to read the complete original Union Grievance filed in 1995 please use this link: Grievance. Air was pulled though the scrubbers by powerful electrical fans mounted to the tops of the scrubbers. Because there is a lot of air pulled through the scrubber, and the scrubber contains packing that should be constantly sprayed with water, it is normal for the air coming out of the scrubber to contain some of this water. The more air that is pulled through the scrubber the more water is pulled with it. If too much air is pulled through the scrubber a visible mist can be seen being discharged from it. During normal operating conditions the scrubbers would emit a mist with a concentration of at least 50 PPM and probably much higher. The conclusion of these facts is that Mare Island had to limit the air flow through the scrubbers to less than 9500 CFM in order to avoid the amount of chromic acid being discharged from the scrubbers being increased by carry out of chromic acid contaminated scrubber cleaning water mist. 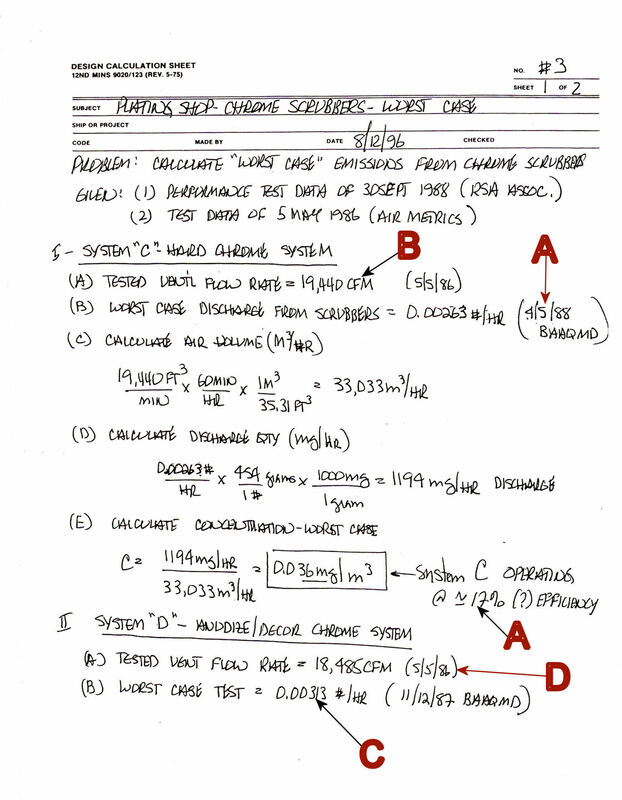 The main question is which of these should be used for the purpose of best case and worst case chromic acid calculations? The 5/5/1986 air flow values are discarded. There is no attribution as to how they were collected. Also, there would have been a severe chromic acid contribution by such large air flows due to contaminated mist. The contribution this mist would have added to scrubber outlet concentration cannot be estimated. The 4/5/88 and the 8/10/88 values are very close but the BAAQMD value is lower. A BAAQMD supervised test has a higher confidence level than does a contractor who has been fed and then parrots dishonest data and statements and so the 5/5/1989 value of 17,000 CFM is selected. Also, this value provides the higher worst case result. The choice is between 10,577 and 10,800 CFM. These are within the limits of measuring instrument error and so the lower of the two is selected because it provides the higher worst case result. It is an element of the perjury on Management Exhibit No. 11 that the carryover of chromic acid contaminated mist from the scrubbers was not estimated and added to the total chromic acid emitted from the scrubbers during normal operation. Just how large an element this is will be provided in future calculations to be posted on this page. Right now I can only estimate from the data that this contribution will be significant. There is no direct data about this mist because the tests of 5 and 6 April and 10 and 17, August 1988 were performed with scrubbers that were being provided with clean water and so the contaminated mist contribution of chromic acid to these test results is zero. However, the spill of February 17, 1988 indicates that the chromic acid being discharged from the scrubber had a chromic acid concentration was between 500 and 700 PPM. Also, the tests of April 5, and 6 contain relative humidity data and so it is possible to perform calculations that will demonstrate, to a reasonable degree of accuracy, the contaminated mist chromic acid concentration that was not measured during the tests. This contaminated mist provides one more reason why the scrubbers normal condition was to be run without water. The common sense solution to this situation is to conclude the scrubbers don't work and don't satisfy the purpose of their intended function. One would suppose an employer with a conscience the size of even an atom would come to this conclusion and find scrubbers that worked and replace the bad ones with good ones. But this didn't happen. Mare Island just simply shut off the water and looked the other way. They had to look the other way because they had to know that scrubbers without water were ineffective and this was demonstrated to them in a way that could not be ignored by the BAAQMD 1987 tests that demonstrated they were 17% and 7% efficient at best. The question naturally arises, were the scrubbers operated with water flows during the 1987 BAAQMD tests? The answer has to be yes because they were being operated with water during the February 17, 1988 chromic acid spill. Also, the BAAQMD would never have supervised tests of scrubbers run dry. It is probable that what happened is that prior to the 1987 BAAQMD tests Mare Island just operated the scrubbers dry. Then, when they were picked for the 1987 BAAQMD supervised tests, they just turned on the water and kept the system running with water after the 1987 tests because they were afraid the BAAQMD might make a return visit and didn't want to get caught running the scrubbers dry. The spill of February 17, 1988 demonstrates the plating shop people were metal platers. They had never been trained or schooled in scrubber design or operation and so were not responsible for what happened. It was a Management responsibility to make the necessary decisions to expend the funds necessary to ensure every resource was provided to ensure these very important pieces of safety equipment were working properly and they refused to do this. The scrubbers were run with water for a short time while the concentration of chromic acid just went higher and higher in the recirculating water. Once it got beyond the ability of the IWTP to handle the contaminated fluid (50 PPM), which happened quickly, it was just left to re circulate as the concentration of chromic acid continued to build up. Then, finally on February 17, 1988 the concentration of chromic acid in the circulating fluid became so high (500 to 700 PPM), the fluid became so thick, it just blew out the top of the scrubber.